Apart from specific HVLP models and airless paint sprayers, you will not get the right air flow or pressure in just any regular paint sprayer. For a flawless paint job, you need a solid air compressor that will give all your projects a store-bought finish. This is where a quality air compressor comes handy. 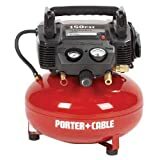 Whether you are a professional painter working at a job site or one of the DIYers enthusiastic about home projects, a good quality compressor will make all the difference. Not only will it be compatible with different paint sprayers, but it will also have all the best sought-after features. To help you find the finest air compressor for your painting needs, we have provided in-depth reviews on our top five favorite models among the hundreds available in the market. Along with this, we have also compiled a buyer’s guide on the different factors and features available in a compressor. Thus, you will have enough knowledge regarding the different elements to look for before investing in one for your projects. To make it easier for our readers, we have analyzed many compressors in detail and then, listed our top five picks with their features, pros, and cons, and the benefits each model offers you. Read the following article to choose the one that suits all your requirements. At the bottom, we have also listed the best features to look for in our detailed buying guide. 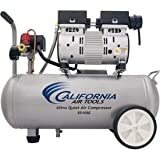 California Air Tools is known for producing the best quality air compressors over the years. Hence, the 10020C model is bound to give you the power and qualities to execute the finest paint jobs. Since CAT 10020C is a replacement for the CAT 10020, you will get upgraded technology in the newer model. To begin with, 10020C provides a 2.0 horsepower that makes this compressor ultra-quiet. With only 70 decibels of sound, you will not have to suffer from irritating loud noise while working. Along with this, the motor offers a low 1680 RPM that ensures lesser motor wear. As a result of lower noise and motor wear, your machine will be extremely durable and have a longer lifetime. In addition to this, CAT 10020C integrates state-of-the-art technology like dual oil-free piston pump to give you the finest qualities. Consequently, you get up to 3000 hours’ worth of strong performance and durability every time. Since most portable air compressors offer about 500 hour’s life cycle, you get to use this model for extended periods of time. Moreover, oil-free pumps ensure that you get stabilized movements on rough surfaces too. With CAT’s Easy Start Valve automation, you get better cold starts at even lower temperatures. This means that the motor can spin freely at the start while releasing only a small amount of air and using less starting amperes. Another positive feature of CAT 10020C is its portability. With an integrated wheel kit and a compact design, you can easily move this compressor to any job site. Also, it provides a huge air capacity of 10 gallons which is much more than what other brands have to offer. This model offers 6.40 CFM at 40 PSI and 5.30 CFM at 90 PSI with a one year warranty too. Rolair JC10 Plus is a replacement for its older JC10 model. Thus, it has upgraded and better features to offer compared to the previous one. Since this brand has an experience of almost 50 years, you can rest assured that you will get only the best products with each purchase. Firstly, this small air compressor offers a dynamic one horsepower motor. As a result, you will get an ultra-quiet motor producing only 60 decibels of sound. In a market where most of the quiet air compressors are too loud to even listen to songs or talk to someone, this model is perfect to use even indoors for long periods of time. Secondly, Rolair JC10 Plus uses oil-free piston pumps which enables them to be more durable than other compressors. Because of lower motor wear, you will even have to spend less on servicing at a maintenance shop. Furthermore, this two-cylinder pump is made from high-quality cast Aluminum and is powered by a motor spinning at 1700 RPM. Thus, you get better cold starting at even low amperage. Similar to its previous model, JC10 Plus also comes in a robust roll cage. This protects all the important components like the tanks, gauges, and the integrated cords from damage. Apart from all this, you get 2.35 CFM at 90 PSI with this compressor for all your finish work. With a weight of only 42.9 pounds and an extremely compact design, this air compressor is also quite portable. This model is over-all one of the best air compressors in the market. However, there are some drawbacks that put it in second place to the CAT’s 10020C model. This includes a smaller tank capacity of 2.5 gallons and usage for a shorter period of time. This garage air compressor is manufactured with the classic pancake compressor look in red and packs multiple features in its body. Thus, we have titled it, ‘Best for the Money’. To begin with, this model comes with a water drain valve and integrated rubber feet that you cannot find in other compressors. This makes it much more stable for all your jobs by reducing strong vibrations and movement. This model of compressor offers a maximum of 150 psi tank pressure and a six-gallon capacity. Thus, you get to store a large volume of air for continuous extended use. Along with this, you get 2.60 SCFM at 90 psi which ensures a quicker time for recovery. Since this compressor uses oil-free pumps, your machine is bound to be extremely durable with a long lifetime. Also, it will require next to none maintenance saving you a lot of money spent on just servicing. The most unique feature of Port-cable compressor is its ability to support two users at a time. With factory installation of two regulated air couplers, you get more efficiency and versatility. To protect crucial components from damage, it comes with a shroud, cord wrap, and a console to cover the motor. Furthermore, it is easy to start the compressor in even cold weather due to the powerful low-amp 120V motor. Apart from all this, porter-cable is highly portable with a weight of about 31.2 pounds and extremely compact design. Also, you get firm handles at the top of this machine so that you can move it around quite easily. Unfortunately, this air compressor is also not without fault. It has an undesirable noise level of over 80 decibels and a complicated break-in procedure due to which it cannot beat the other two choices. Campbell’s air compressor is ASME-certified and also offers a huge amount of qualities that makes it compatible with almost over 20 air tools. To start with, it has a huge air capacity of over 80 gallons, a five horsepower motor, and a maximum of 140 psi. Since it is made from cast iron and has four integrated cylinder pumps, you also get a very reliable lifetime of over 10,000 hours. Such features make it perfectly suited for extremely heavy-duty industrial work. Apart from this, it delivers maximum pressure of about 9.6 bar and 16 CFM at 90 psi for maximum airflow and to work with multiple air tools for jobs like painting and sanding. Campbell’s compressor enables you to complete all your tasks easily and in the shortest time possible. Although it has many amazing features, this compressor cannot be called a winner. This is due to the fact that most of the heavy-duty and professional industrial operations it is built for, can be performed by cheaper, lighter, and thus, better air compressors. Other drawbacks of this equipment include its heavy weight and lack of portability, space-consuming design, and even noisy working motor of over 86 decibels. This brand has managed to not make just one, but two of their products in our top five list. Thus, you can see how they have perfected their models to contain all the best features while also keeping them user-friendly. First of all, this compressor has a motor with one horsepower, making it ultra-quiet producing only 60 decibels of sound. Along with this, you get revving at about 1680 RMP which makes sure that your powerful motor does not wear out. Secondly, this compressor offers a tank capacity of 5.5 gallons and a protector for thermal overloading. With innovations that provide tank fill-up at a faster rate and a recovery time of 90-120 psi, this model is one of the best from the vast variety available in the market. Moreover, it uses oil-free dual pistons so that you get a durable machine with low maintenance cost. Similar to other CAT models, this one also uses the Easy Start Valve mechanism for cold starts with low amperage at lower temperatures too. Although it has many useful features, this compressor has some drawback that prevents it from ranking higher like the other model. Some of them include their ability to rust, leaking air pressure, and low CFM. Whether you are a professional painter or a novice, choosing the right air compressor can be a tough job, isn't it? And oftentimes, product reviews or just people’s opinions are not enough to make a final decision about a product. You, yourself, need to do research on different products, and compare features before making a final purchase. However, since researching is time-consuming, we have done that for you. The following buyer’s guide has been written to make you aware of the different features in a compressor. Before investing in one, read the next section to know about the qualities you should be looking for in an air compressor. Air compressors can come in different forms to suit different job descriptions. For example, those found in industrial plants or garages are mostly stationary and vertical. They are often quite heavy with larger air capacity and higher horsepower to suit the required heavy-duty work. On the other hand, air compressors suitable for DIYers for their home project are compact, lighter, and easier to maneuver. This makes them quite portable and thus, easier to move around. These technical terms are more useful for professionals but beginners often ignore them. PSI stands for pounds per square inch and a higher value accounts for higher pressure in your air compressor. However, it does not always necessarily mean better functioning. CFM is a better term to compare multiple compressors. It stands for cubic feet per minute and higher ratings translate into air compression at a faster rate. HP or horsepower is another technical term used to measure the motor’s output along with PSI and CFM. Most of the air compressors used at a smaller scale, such as home projects, work well with just one to two horsepower. They are perfect for furniture paint sprayers marked with a rating of 6 CFM and 30-40 PSI. Motors with 1-2 HP have even integrated well in almost all the compressors available in the market. The only thing that you have to make sure is that it supports the commercial paint sprayer you intend to use. Oil-free pistons have started replacing pistons requiring oil lubrication in recent years. This is because the latter pistons needed undesirable and time-consuming regular maintenance. Thus, manufacturers invented oil-free versions to save not only time but also money. Although oiled air compressors are heavier, expensive, and require maintenance, they are also much more durable and noiseless. On the other hand, oil-free versions are lighter, cheaper, and maintenance-free. So which one should you opt for? If you are looking for an air compressor for lighter work-load, it is better to go for the oil-free ones. However, oiled compressors are still preferred over oil-free ones when it comes to heavy-duty industrial jobs. The noise that some models of air compressors produce can be quite irritating and frustrating, especially for those who intend to use them for extended periods of time in closed places. Therefore, before purchasing one, make sure to check for the lowest decibel rating available to minimize sound pollution in your work area. Apart from this, you can also look for the attachment of accessories like chamber mufflers or silencer filters. Such accessories can also reduce noise through different methods but it will require extra money. To summarize, we have considered all the important features in our five products and California Air Tool 10020C definitely reigns as the champion. With features like large tank capacity, high PSI and CFM rating, wheels for portability, and 30% less sound production, we can see why it is our top pick. On the other hand, Rolair JC10 Plus makes it second on our list just because of smaller tank capacity and inability to work for a longer time. Porter-Cable has been titled, ‘Best for the money’ since it provides multiple useful features in a small compact design. 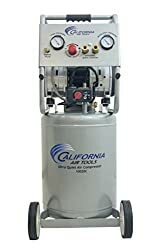 Campbell’s compressor is perfect for heavy-duty industrial use while the last one, California Air Tools 5510SE does not top the list only due to some leakage and rust issues. 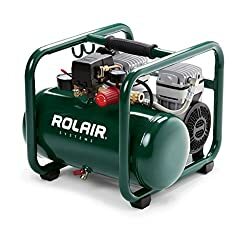 Hopefully, this article and buyer’s guide has been helpful enough for you to make a final decision on the best air compressor for you. Thus, invest in one that suits all your requirements and get flawless painting jobs!